Not a special cake in many ways, but a very special one for many of us here. Today you can find a huge variety of fine, exquisite patisserie in Japan, but it wasn't always like that. When I was little, cakes in general were mostly a special-day thing. A treat. They were something you'd get for an occasion, such as birthday or Christmas. There would be a decent array of cakes for you to choose from, but the one that was the most common was strawberry shortcake, which you'd find virtually every cake shop in the country. When I say "strawberry shortcake", many of you may probably think of the kind that consists of biscuit-like thing, served with fresh strawberries whipped cream. And I enjoy it myself, yet the strawberry shortcake for us Japanese in general is actually a layer cake - often large, round sponge filled with fresh strawberries and whipped cream. There doesn't seem to be anything particularly special about it when I put it that way, but we can be quite particular when it comes to strawberry shortcake; the sponge must be light and fluffy (which is achieved by whipping eggs and not by using baking powder; very little butter used in there), and the cream must be fresh cream (not butter cream). And strawberries absolutely must be fresh - not jam, not stewed, just plain fresh. And this multilayer goodness would usually be done up with pretty icing like these, making it a magnificent piece of beauty that deserves to finish a celebratory feast. 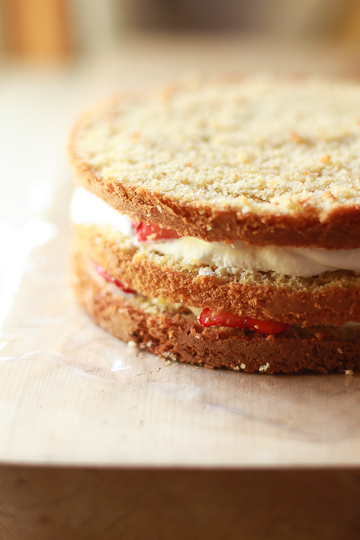 As a kid, I'd be happy to have any sort of cakes, but I remember feeling really excited when we were getting strawberry shortcake from a shop, or when my mother was making one. I bet many of the people in my generation would feel the same way. It was the queen of fancy cakes. 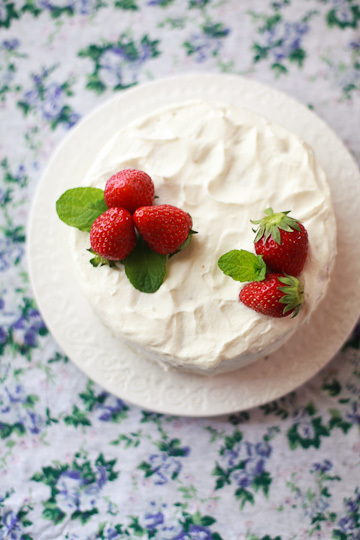 As I got really into baking as a teenager, I'd bake all sort of things (though mostly simple stuff, I must admit) and strawberry shortcake was one of them. It was still not an everyday kind of cake, partly because it still held that 'cake for a special occasion' status, but mostly due to the fact that it was rather a fussy cake for me to make. I had no problem with baking the cake, but it was the assembly and frosting part that put me off. I have always been a clumsy one in baking (or pretty much everything else to tell you the truth), and had absolutely no skill or patience to complete a job that requires precision and aesthetics. So on those not-so-frequent occasions when I did decide to make strawberry shortcake, I'd turn to my neat-handed big sister to finish the cake (just like I did more recently; some things haven't changed much after all these years). 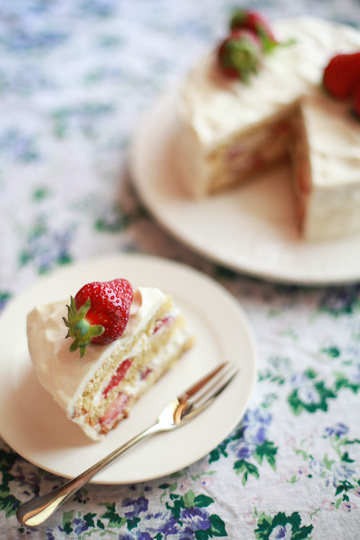 So often when we wanted strawberry shortcake, we shared roles: mom would buy the ingredients, I would bake the sponge, and sister would finish the cake. And all of us, including dad, would share the cake eating part, all very happily. It was around when I was in college that we started seeing more authentic Western-style cakes, most notably French pastries, both at pastry shops and in baking books. Now we had an increasingly bigger choice of cakes to buy or bake, and we could go for something more 'novel' and 'interesting' than plain old strawberry shortcake. There was a period when I barely cooked, not to mention baked, when I was working crazy hours at the office and had hardly any time to spend at home. Even after I started working from home and getting back to cooking, strawberry shortcake didn't really come back into my repertoire. For one thing I was more excited about trying out all sort of more 'unusual' (for me anyways) recipes from foreign baking books and recipe sites. And besides, I still wasn't all that into the idea of making fancy cakes (my sister wasn't always there to give me a helping hand, you see). So for one reason or another, I didn't make strawberry shortcake, I mean Japanese kind, for a very long time. The last time I made one was more than five years ago, and it wasn't even a 'proper' one - a large, round, decorative sort. As a matter of fact, I didn't have a round cake pan for layer cakes at hand... until this week. I somehow got myself a small-ish round cake pan, a 15-cm/6-inch one, and the first thing that came to my mind was: how about making strawberry shortcake? It wasn't what I had had in my mind when buying it, but it just felt right to break in my brand-new old-fashioned cake pan. I happened to have all the ingredients I'd need to make strawberry shortcake, so I got down to it straight away. 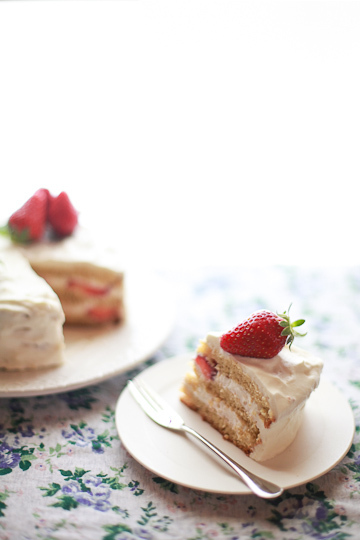 I baked up sponge, sliced it into not-so-even layers, smeared them with some whipped cream and scattered with sliced strawberries, then fought a lonely battle that was to ice the cake. I suppose I was feeling a bit ambitious to decide to make strawberry shortcake by myself, but not ambitious enough to dare to aim for a perfectly pretty one like those you'd find at a cake shop or in a baking book. Instead, I opted for a purposefully casual, rough-around-the-edges sort of look, which means a cake can be perfectly fine even if it doesn't look perfect. So my Japanese strawberry shortcake would never occupy a space on the top display shelf at a pastry shop or grace the cover of a cake book, but it was okay by me. My little big cake looked pretty enough adorned with a few berries, and tasted perfectly lovely with the fluffy sponge, pillowy cream, and juicy strawberries - giving any of the good shortcake we used to eat a good run for its money. There must be hundreds of recipes for Japanese strawberry shortcake out there, and here I used this one (in Japanese) that I found online. If you would like to try your hand at it, Google translation fails to deliver (again), but at least you can get a list of ingredients. For the most part, I found this recipe (in English) to be very close, although I haven't tried it myself. Apart from the small differences in the amount of ingredients, mine was a three-layer cake just as the Japanese recipe says (actually you get about four 1/2 inch-thick slices, and use only three of them). If I might add some notes, I baked the sponge in the evening and let it cool overnight, covered in plastic wrap while it was still hot so it wouldn't get dry. I filled and iced the cake on the following day, and chilled it in the fridge for another night to let the finished cake 'rest' before serving it. 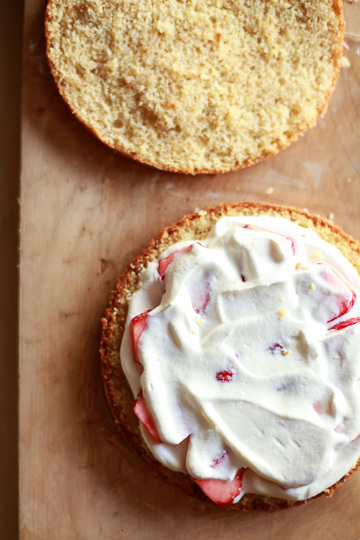 This resulted in a beautifully moist cake with all the flavors having mingled together. But that doesn't mean this has to be a three-day project; it can totally be done in a day as long as you have enough time to let the baked sponge cool completely and chill the finished cake for at least an hour. I should also add that an electric mixer comes extremely handy to whip the eggs. Now that I have satisfied my urge to make strawberry shortcake, I don't think you'll find me making this again anytime soon. After all, it's a fussy cake to make (for me), and it still does have a special-occasion cake feel. Which reminds me: although it wasn't my intention when I made mine, this would make a perfect Mother's Day cake, which happens to be this Sunday. So it's second Sunday of May, and we are nearly halfway through the month. But there is something I wanted to mention here. 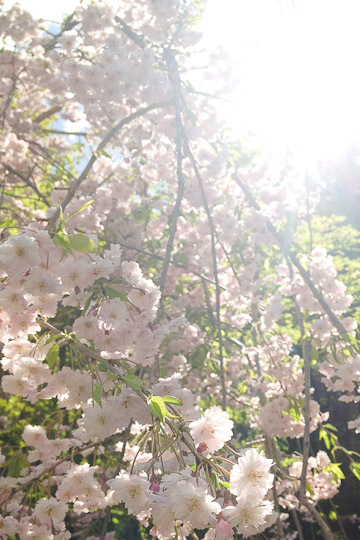 Remember my rambling in my last post, about my not having been able to see cherry blossoms on a sunny day? 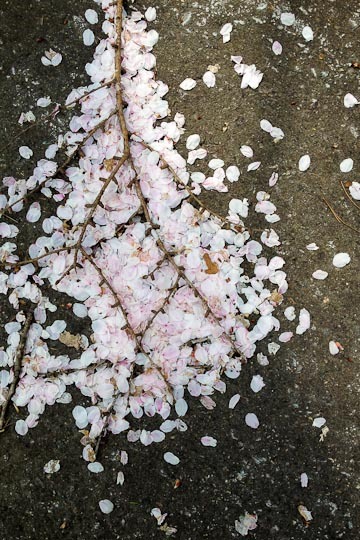 I know it's unfashionably late in the year to talk about sakura, even in a place like here where spring arrives later than many other places. But guess what? 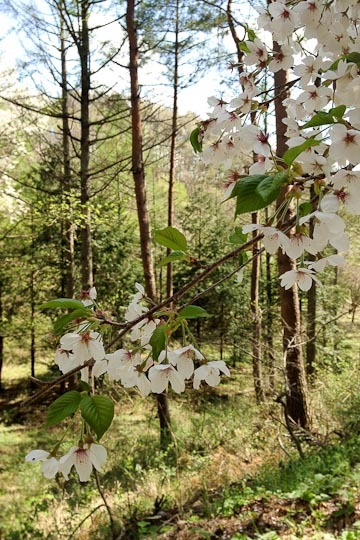 The sun did show up just in time for the last of the cherry blossoms in brief bloom in the mountains. 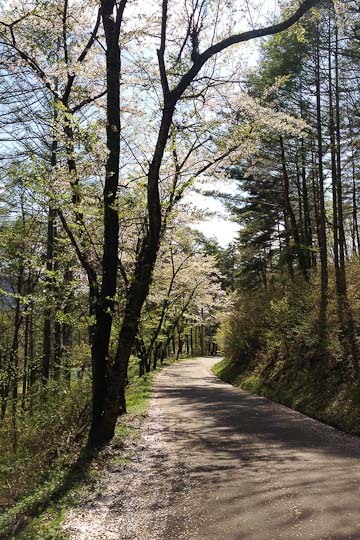 Last weekend it finally got clear and sunny, and I took a short walk near our place in a hope to catch the last quick glimpse of the blossoms. 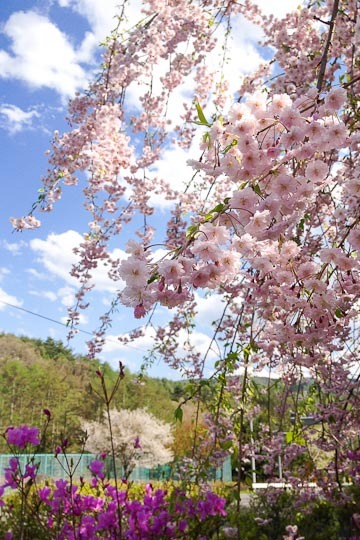 The most common kind, Somei Yoshino, was nearing to an end with young leaves replacing the blossoms, but some thick-petaled yae-zakura was in glorious bloom, dancing in the wind under the spring sun. We have since had some seriously windy days and a lot of rains, and they were all gone in a matter of a few days. 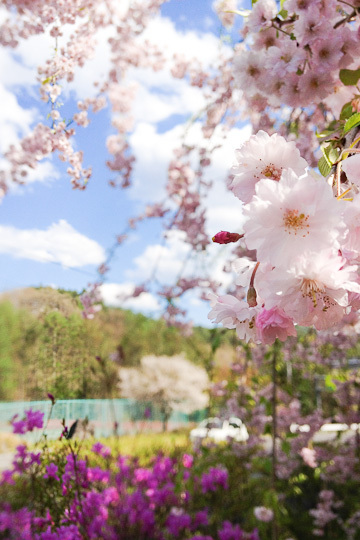 But I'm still happy I got to enjoy a moment of admiring the pretty pink flowers glowing under the bright blue sky. The cake looks so beautiful and classic! Your photography always brings these stunning creations to life! Definitely adding this to my "must make" list! 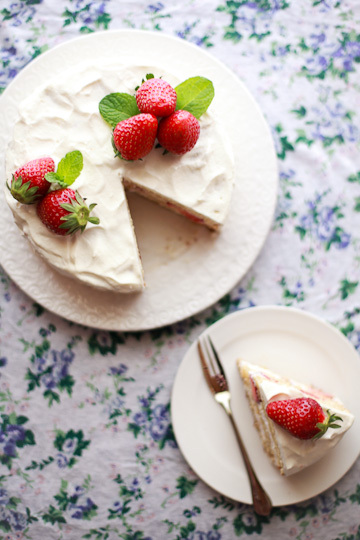 Being in Japan last Christmas, I refrained myself from making a strawberry shortcake as I had scruples about eating strawberries in the middle of winter, but now that spring has come... I would try to make it more perfect even if I could : I like very much the uneven cover you gave to it. Thank you for this new great note. Ah, it maybe commonplace but it is still a special cake...because you made it. I prefer fresh strawberries myself. Your strawberry shortcake looks really delicious. It might be simple, but it definitely has your beautifully elegant touch. Also, I just realized I've been watching this blog for about 5 years and I'm still stunned by your pictures + words. Thank you! ever since moving away from japan. 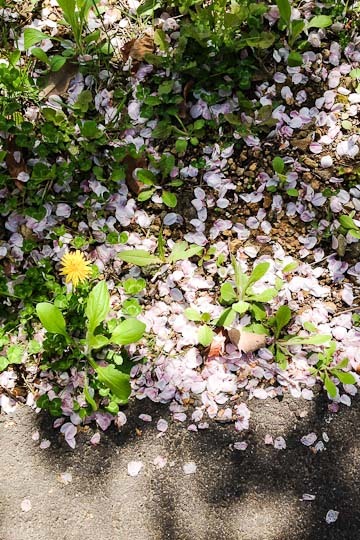 blog, such lovely photos & words! as usual, lovely photos - of both the cake ans blossoms! Like others i am a silent reader of your blog. To me is a very special delight. I "collect" your photos just to enjoy the beauty of them and to inspire my food presentation. I love your simple and natural style. It is dificult to explain what exactly i like it so much. This cake look i find the best. Maybe, as you wrote, isn't perfect ...to others, but to me is truly perfect. I'll keep thinking what is exactly what i like so much of your blog just to tell you. 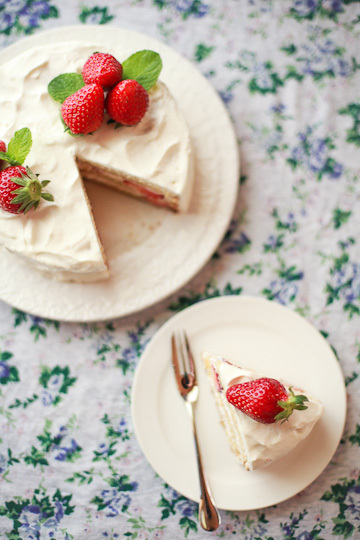 I absolutely love strawberry shortcake and these are really beautiful pictures! Inspiring some baking this weekend! Like you, strawberry shortcake has a special place in my heart:) It's still probably one of my favourite cakes although whenever I'm in Japan it often get superceded by choux creme! That is just so delightful! I love strawberries. It has a lot of memories for me. I think the cake is really special and made even more by your hands. Keep on sharing these wonderful tidbits. It is a fun read.